The average salary for a flight attendant in the United States is around $32,683 per year. Flight attendants earn an average yearly salary of $32,683. Wages typically start from $27,653 and go up to $52,272. How much does a flight attendant make in the United States? How much does a Flight Attendant earn? As airlines struggle to stay afloat and find efficiencies during tough economic times, flight attendant wages have felt the pressure as companies attempt to trim the fat in all aspects of their business. As with other professions, flight attendants earn lower salaries at the beginning of their career and work their way up to higher wages. A flight attendant's hourly wage starts out at approximately $21.00/hr. However, by the 14th year, the hourly wage of the flight attendant will have almost doubled (approximately $46-$50.00/hr). A big part of a Flight Attendant’s salary is compensation for meals when overnighting at a hotel or when meals are not boarded on the aircraft. This is often referred to as a ‘per diem.’ Per diems vary depending on the length of a stay or ‘layover’ at a hotel. 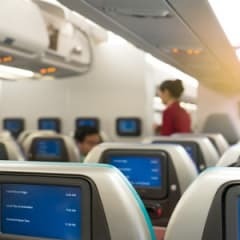 According to FlightAttendantsAcademy.com, many F/A’s eventually become Pursers to boost their salary and to assume new challenges and responsibilities. Junior Flight Attendants can nearly double their salary by becoming a Purser. Some airlines require F/A’s to have a minimum of one or more years of service to become a Service Director. At Air Canada for example, in 2011 a purser on a narrow-body aircraft earned $50.14 per hour while a Purser on the B777 earned $67.92 per hour. In addition to these wages, Pursers are also paid the per diems, night premiums and other expenses that a Flight Attendant would be entitled to. How do flight attendant salaries compare to similar careers? Flight attendants earn about the same as related careers in the United States. On average, they make less than sailors but more than couriers.